Eat What You Love, Love What You Eat is for consumers who struggle with proper eating and weight control. It also contains a nice section on exercise and fitness. • Recommended for: Consumers who are looking for a fresh approach to controlling improper eating. Michelle May, MD is a physician who has struggled with her weight and proper eating. Eventually, she was able to unravel her own disordered eating patterns and began to share this knowledge with others through her "Am I Hungry" workshops. In 2005, she published "Am I Hungry? What To Do When Diets Don't Work." Chapter 4: What Am I Really Hungry For? Chapter 25: I Am Hungry! ...and then describes the what, when, where, why, and how of each. I suspect that most readers will see themselves in one of these 3 profiles and perhaps that alone will help them begin to unlock and overcome detrimental eating behaviors. Most of Part I attempts to get the reader to focus on the most important trigger for eating: hunger. In the final chapter of this section, the author does a nice job of summarizing the mind-body connection regarding eating and explains it in the context of the 3 eating types listed above. In Part II, May reviews the major food groups, including not only carbs, fats, and protein, but, also, water, alcohol, and a general opinion on diets in general. It's good, solid, practical information. As in Part I, she wraps up this section in the final chapter by using the instinctive/overeating/restrictive models to reemphasize the main points. Part III focuses on exercise. Because that is my main interest, this is the section I read first. Most physicians don't encourage exercise enough in their day-to-day interactions with their patients. Fewer still are those who are knowledgeable about the specific health benefits of different forms of exercise. In Part III, author May, with the help of ACSM-certified trainer Rebecca Johnson, MS, has produced an excellent summary. On the basis of this section alone, I can highly recommend this book. One thing I especially liked was how exercise was treated like a therapeutic agent....which it is! Page 249 is a take-off from a warning label for a drug: "Fitness Rx: Exercise, The Best Medicine." 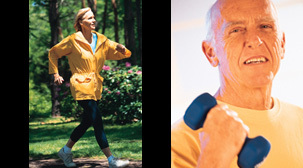 Here, exercise is described in terms of indications, benefits, side effects, precautions, warnings, and even dosage. I wish every single physician in primary care medicine would read Part III of this book. There is even a discussion on pedometers in this section. Part IV is mainly a list of recipes (the author's husband is a gourmet chef), but also includes brief information on depression and anxiety, cholesterol and heart disease, metabolic syndrome, vitamins and minerals, and how to read a food label. At the back of the book, the PAR-Q ("Physical Activity Readiness Questionnaire") and a lengthy list (18 pages) of scientific citations are provided. Another nice touch. • What I Liked About This Book: Everything! • What Could Be Better: It's difficult to find faults with this book, but, if pressed, I would say that it is longer than it needs to be. Perhaps the author might consider producing a "Cliff Notes" version containing the salient points, and the excellent vignettes and "Mindful Moments"? Another thought is the title: because this book covers more than just eating (ie., Part III covers exercise, and, mental health is stressed throughout), I wonder if a different title should have been considered. 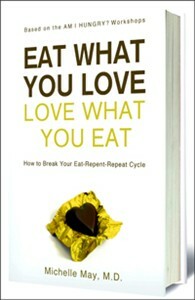 Eat What You Love, Love What You Eat is an excellent resource for anyone struggling with improper eating patterns. But, because this book offers so much more, I can recommend it highly for those who want to address lifestyle-related health problems. Proper eating and regular exercise are the foundation for improving wellness and this book would be an excellent road map to that destination.